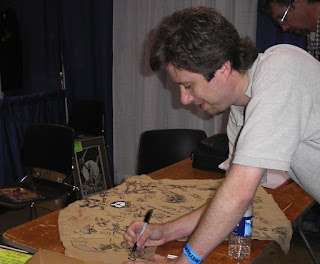 This weekend was my eighth consecutive Chicago Comicon, although in a sense it was my first. 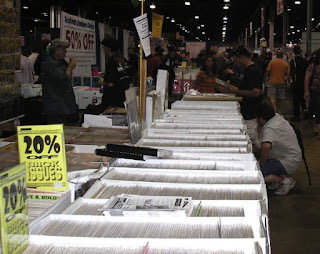 Chicago Comicon is the name it was known by before its purchase by Wizard Entertainment in 1998, and Wizard changed the name back this year presumably to preserve its trademark against the new show arriving in town next year, or perhaps to capitalize on the increasing popular awareness of the name after San Diego. The new branding was evident in many places — and to a great degree the show increasingly resembles another Wizard acquisition, the Big Apple Comicon (also now with the same blue logo). Dealers, artists, and media celebrities were the main focus by far. 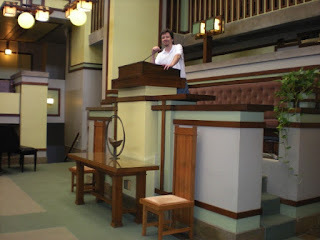 Which was fine by me, for, while none of my publishers set up, I got to spend that much more time visiting and scrounging the hall for unusual finds. At the cons on the coasts, there's not always time — and if you're not driving in, you don't want to buy a whole lot. At a show like Chicago, the Midwesterner can take that plunge on the Howard the Duck movie standee or whatever thing wouldn't fit in the overhead compartment. There were plenty of Star Wars folk about, of course: the local 501st had a booth, where I signed a quilt for their Make-a-Wish auction. 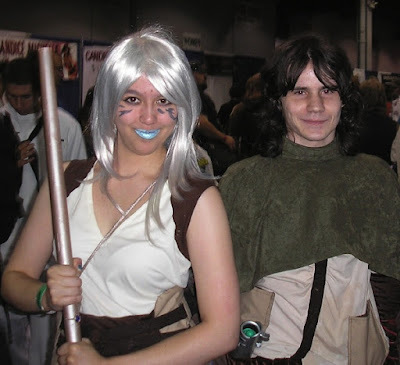 And immediately on entering the hall on Saturday, I ran into Sarah Hsi and Matthew Bidwill, dressed as Jarael and Zayne Carrick from my Knights of the Old Republic series. 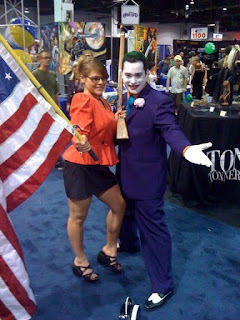 That's the first time I've seen them appear as a duo at a con! Then there was the Comix4Sight auction for John Ostrander — which raised $13,000 on Saturday night in addition to the thousands in donations already raised. There were so many items donated many will continue to be auctioned on the site, so keep checking there. Hero Initiative put together a T-shirt for John with lots of autographs — and John and I got a chance to catch up on Sunday. Also talked with Jerry Lawler, wrestler and, now, comics artist who I used to see buying comics at Memphis Comics & Records years ago; he's running for mayor again, he says. Con Minion Cathe was on hand to help out — I'm now restocked on KOTOR and Indiana Jones trades, thanks to her eleventh-hour find — and I also got to catch up with a lot of friends, ranging from Jim Johnson (whose con report is here) to Susan McNutt, a pal from my Daily Beacon days, who had come into town. Her first comics convention — it's always someone's first! Four days meant it wasn't all time at the convention: there was a Friday-evening foray to Fado's Irish Pub downtown, amid trains hip-deep with kids going to Lollapalooza. This is only the third Jarael I've seen -- but then I don't get out as often as I'd like!